Sharon asked what supplemental warp is. I quickly looked in the indexes of a couple weaving books but didn't see a definition right off the bat so I tired of that and thought I'd give my own. 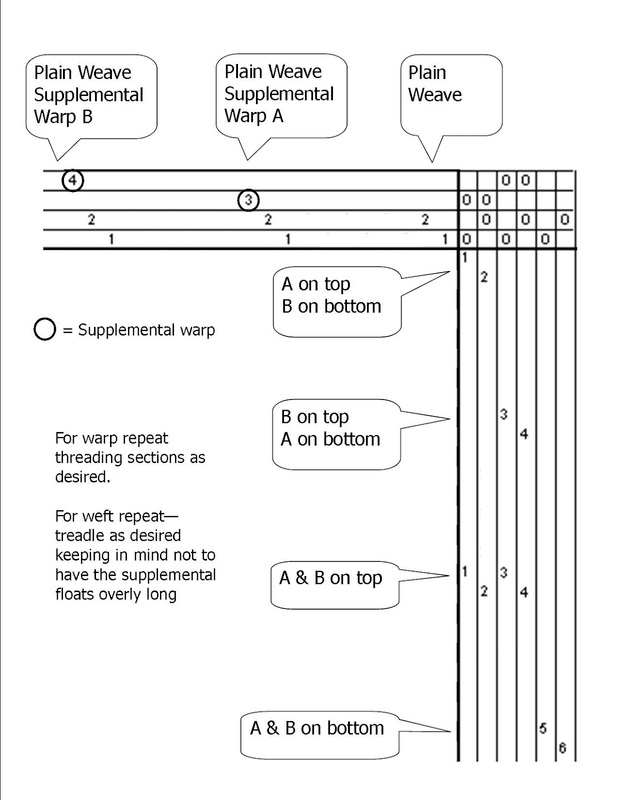 Supplemental warp is a warp end that is in addition/supplement to a ground fabric. If the supplemental warp ends were cut out a viable fabric would be left, plain weave in this case. If you're familiar with overshot you can think of that as a supplemental weft - the pattern threads in overshot are in supplement to the plain weave weft ground fabric. The above diagram shows the draft I'm using for my current scarf warp. I threaded the plain weave sections for however many ends as I wanted, then when I wanted to put in a supplemental warp I threaded those threads (novelty rayon in this case) on either harnesses 3 or 4. 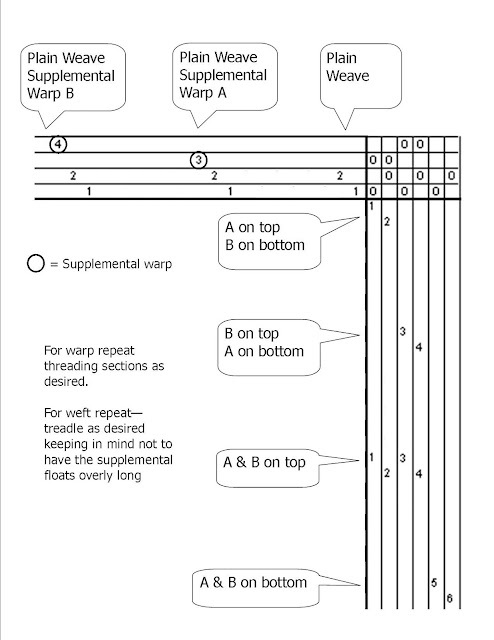 You don't have to use both 3 & 4 supplemental warp ends, you could just use 3 - using both gives you supplemental warps that raise at different times. Then I treadle randomly repeating the different sections how ever many times as I'd like. I like the changes in the lengths of the supplemental warp but you may choose to weave the same over and over to have it consistent. Going beyond this you can pretty much use any kind of weave structure for your ground fabric - twills are especially nice. You can also have as many different supplemental warps on different harnesses as you like to have them lift at different times. You are only restricted by the number of harnesses you have on your loom. Back to overshot - if you know anything about turning drafts, if you turn overshot your pattern threads become supplemental warps. Oh, I almost forgot. Sometimes as your weaving progresses your supplemental warp ends may become looser in tension than your plain weave sections because they're floating more, less intertwining, so there is less take-up in them. I haven't found this a problem with my 12 yard warps but if it becomes a problem all you need to do is slip a dowel between those ends and the rest of the warp and let it hang off the back of the loom with a little weight on each end. Or if you have a double back beam you will beam the ground warp and supplemental warps on separate beams. Ok, so did this sound confusing? I'm probably not so good at explaining in print. If you're interested just give it a try using the above draft, experiment with it. Thank you so much for taking the time to post these instructions. I really don't get the hang of it yet - so far, but I'll come back and read this again and see if the fog lifts.